This Danish studio is focused on creating accessories and furniture based in sculptural, Nordic minimalism. The materials are all thoughtfully curated, resulting in simple clay bowls, spherical desk sculptures, and small pieces like wall shelves and side tables based on cube shapes. AYTM is all about modern elegance: luxurious accessories crafted from marble and gold metals, velvet stools supported by thick metal frames, and magazine holders crafted from rows of curved metal rods. Time & Style has actually been around since the '90s, but their stores are only in Amsterdam and Japan, which may be why their name is new to you. With a focus on exacting Japanese craftsmanship, Hokkaido factory allows them to have an unusual setup: They're completely independent and don't rely on any type of outside suppliers. This results in pieces that scream high-quality craftsmanship. Bosnia-based Gazzda uses wood as the basis for most of its designs, and opts to incorporate natural elements wherever possible. The designs sport clean lines that mostly have some midcentury flavor. But our favorite piece we saw was a wood bookshelf that used strands of white rope to create bookends. This Italian furniture house is all about curves — whether on '70s-inspired upholstered benches or classic dining chairs. This Icelandic company works with a variety of designers to make beautiful objects that are sustainable and environmentally responsible. This results in marble accessories in a variety of hues as well as minimalist shelving that could work in literally any style of home. We are dying to find the U.S. equivalent to Durat, a Finnish brand that makes composite material made from recycled plastics. Their booth of sinks, shower/bath set-ups, and countertops came in delicious-looking candy colors replicating the look of terrazzo. Johanson's pieces (mostly seating) may be specifically designed for public interiors, but we couldn't help staring at the interesting lines and shapes — especially a dramatic loveseat with an incredibly high cocoon. In a nutshell: Ogeborg presents sculptural rugs that play with fun colors, shapes, and textures. We adored Ton's fun seating — all of which brought fun twists to traditional Scandinavian design and bentwood chairs. The robin's egg blue styles especially stood out. When we came upon this booth, the wood-heavy, minimalist designs, along with the name, led us to think Nikari was a Japanese company. Oops. They're actually based in Finland and have been around since 1967. The pieces beg to be touched and create the perfect visual balance between straight lines and curves. If we could only source products for our homes from France's Eno Studio, we'd be completely fine with that. Just to list a summary of the awesomeness: sculptural glassware in smoky colors, globe lighting, velvet seating in rich hues, gold floating shelves, and graphic wallpaper. String is a classic example of cool Swedish practicality: The company created the original String shelf in 1949 and has been evolving it ever since to meet modern demands. New Works is a collaborative Danish design house, and again, in Scandinavian tradition of perfection, you can see the intense thoughtfulness in each creation. The pieces for 2019, overseen in collaboration with Lotta Agaton, are highly tactile — smooth leather loveseats; heavy metal candleholders with accordion shapes; a daybed with creamy, textured upholstery. Poiat, based in Helskini, designs interiors (everything from private homes to offices and restaurants). 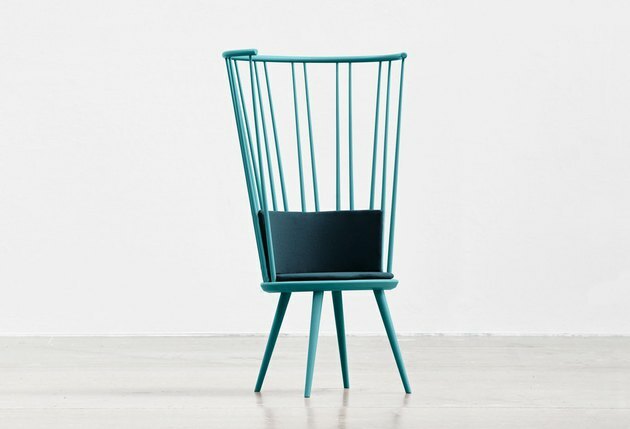 The firm began creating furniture in 2014 and while the collection is small, just: wow. It's their wardrobe/sideboard/cabinet-type pieces that steal the spotlight, with sides made up of vertical wood poles. Swoon.